"Man, You play great, I love the way you connect your sound." Benny Green. Drawing influences from the classic jazz piano trios of the golden age of jazz such as George Shearing, Duke Ellington, Nat King Cole and Wynton Kelly, the Rob Barron Trio plays new exciting arrangements of timeless popular songs, from Rodgers and Hart to Stevie Wonder, music to uplift you on a Saturday night. A mainstay of the London jazz and studio scene, Rob has performed with artists such as Al Jarreau, Marlena Shaw, Phil Woods, Bob Mintzer and Benny Golson, the BBC Big Band, the Ronnie Scotts All-Stars, Jacqui Dankworth, Ian Shaw, Claire Martin and Dave O Higgins to name a few. Joining the trio tonight is one of the finest jazz vocalists to emerge on the scene in recent years - Atila. 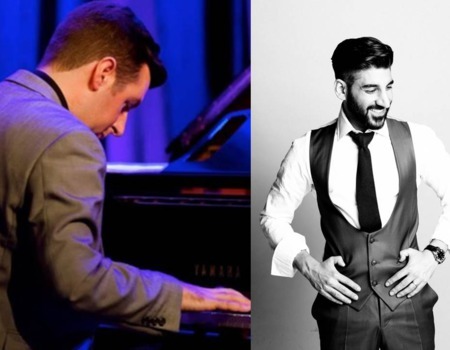 Sartorially stylish and musically classy, Atila's interpretations of the American Songbook are internationally renowned, taking influence from early Frank Sinatra and Mel Tormé. Atila has toured extensively with the legendary Buddy Greco, jointly appearing on BBC radio 2 with the John Wilson Big Band at Cheltenham Jazz Festival. He has given sold out shows at Ronnie Scott's, The Hippodrome Casino London and The Stables Wavendon, and was invited to America to sing 'The Nelson Riddle Story' by the Nelson Riddle Foundation. "I was very impressed with his singing, he has a real feel for the lyric." With a sold out show at the London jazz festival last year this promises to be a night not to be missed full of your favourite songs from the golden era of the American song book.